Fresh from her debut, sold-out tour of the U.S., Catherine Alcorn wows audiences all over the world in her stage show, The Divine Miss Bette. 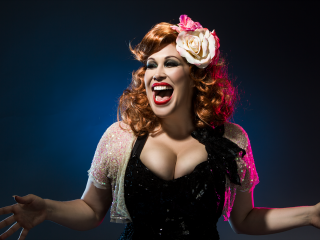 The audience will become intimately acquainted with one of the greatest cabaret artists of our time in Alcorn's role channeling The People's Diva, Bette Midler. Trained by Steve Ostrow, the man who discovered Midler, Alcorn will take the audience on a thrilling roller coaster ride back to the Palace Theatre, New York 1973 as she belts out the divas early classics including “Stay With Me Baby,” “You’re Moving Out Today,” “The Rose,” “Wind Beneath My Wings,” “Boogie Woogie Bugle Boy,” “In The Mood,” and more.